Nithya, a vivacious, intelligent and driven college senior has always known what she has wanted: a successful career in medicine and the love of her family. She's even come to terms with the idea of an arranged marriage, a tradition her conservative Indian family has held up for thousands of years. When a night of partying puts her on a collision course with danger, Nithya's entire life changes. First Line: "I've been drugged." 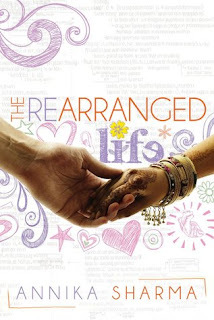 Review: The Rearranged Life is a forbidden romance type of novel, but I found it to be more than that it was also about standing up for yourself and doing what makes you happy and realizing life isn't always going to go the way you planned. Nithya is an Indian girl born and bred in America. Her parents are pretty traditional Indian parents, they believe in arranged marriages, not the sort where she has no say so but where they find and approve the guy and then if the two hit it off they get married. They are not for love marriages at all so poor Nithya can't follow her heart without breaking her parents. It's crazy how well I could relate to Nithya, I also married someone out of my culture and shocked everyone in my family so I definitely understood the inner conflict she was facing when it came to that. She has always been the perfect daughter doing everything her parents want and making a lot of sacrifices to keep her family happy but what happens when your family expects you to make the ultimate sacrifice...love. When Nithya meets James you can tell there was an attraction there from the get go but she knows better then to act on it so she tries to keep it strictly platonic too bad her heart didn't get the memo. While James is growing on her Nithya's family has plans to pair her up with Nishanth a son of an old family friend. I'm not going to lie when I met James I loved James when I met Nishanth I loved Nishanth, but you can easily tell which guy was meant for her, one she had feelings for the other it was more of an obligation. I loved seeing Nithya's character grow throughout the novel and I felt James was a big part of it, he challenged her and she was able to be herself with him without wondering if he was going to judge her or not, honestly it was like she felt more free with James. I mean how can you not root for the two and hope she makes the choice that will lead to her happiness. Overall Sharma wrote a beautiful story with a sweet romance and endearing characters. ~"I want you. I want to be rebellious and safe, wanted and challenged, broken and whole, and I want it all with you.I am all in." ~"He has seen me at my most vulnerable, in a disorganized mess in class and in a heaping ball of tears on his floor, yet he sees greatness in those experiences."